Manuscript must be original and should not have been published previously any where. Authors should follow the ijsrd Manuscript format. Manuscript must be written in English using MS-Word (doc or docx format only). Only "Times New Roman" font should be used. Manuscript should contain maximum of 10 pages. Maximum number of authors is Five. Include Index terms or Key words are to be included in the abstract. Authors are required to sign the ijsrd copyright transfer form, once the manuscript is accepted. The publishing fee has to be paid immediately after the notification of acceptance. 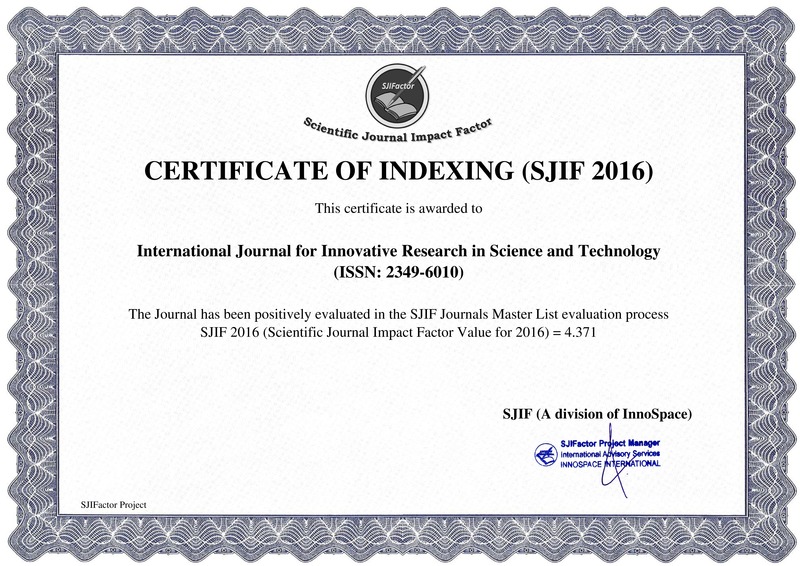 Responsibility for the contents rests upon the authors and not upon the IJIRST (International Journal for Innovative Research in Science & Technology), its committees/boards or its members. The names and email addresses entered in this journal site will be utilized solely for the expressed purposes of this journal and won't be made accessible for whatever possible reason or to any viable gathering.